Bullet design has come a long way from the days of the roundball. Today’s high-performance cartridges will handle just about anything you ask of them, but is all that energy really necessary on whitetails? Sometimes we tend to ignore, or at least give short shrift to, the most important piece of hunting gear in our arsenal. No matter how much you paid for your rifle or your optics or the rest of your gear (including the cost to hunt), when you pull the trigger, everything hinges on one bullet that cost you around a dollar. In the earliest days, a round chunk of pure lead got the job done. Then, we went from powering our rifles with primitive black powder to the new nitrocellulose smokeless stuff, and speeds increased until pure lead couldn’t take it. But lead was still the ideal material for raising havoc internally, so we shielded it with a protective coat or jacket. Now we were in hog-killin’ heaven, but muzzle velocities kept increasing, so we just made the jacket, usually copper or a gilding metal, thicker and tougher, trying to keep up with the speed and energy the increasingly more powerful cartridges were delivering — but we soon hit a design dilemma. Modern rifles and cartridges were allowing shots far beyond what was previously practical, and bullets meant to strike a target at 50 yards required different features than a bullet that was going to fly 350 yards out. The trick was to make a bullet that would hold together, hang on to its jacket and still expand whether it struck the target at 3,000 fps or 1,200 fps. 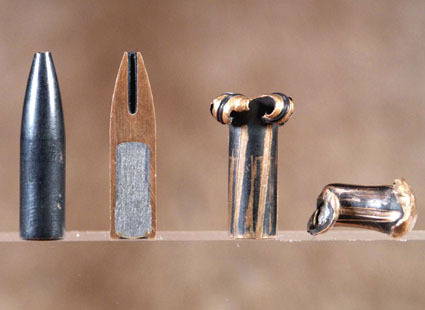 A tall order, but by the 1980s, the problem and most of the research and design effort gave us a very dependable and diverse selection of bullets that would cover the power and velocity span from the likes of the .30-30 on up to the 7mm and .300 Win Mags. It took some very creative thinking to get us here, and one man in particular might have been responsible for the first real bullet breakthrough. John Nosler’s “Partition” is really two bullets in one. The softer front half expands quickly, while the rear base, separated from the front half by a solid copper web, drives deep into the target. With that approach, it would reliably hold together yet still expand if a target was hit at 50 yards when the bullet was moving at maximum speed, or if it was hit at 400 yards when the bullet had slowed down considerably. That thinking spurred the jacket redesign frenzy until every manufacturer’s bullets were up to the task. It took a lot to get to this point, but tapered jackets were bonded to the lead cores by chemicals, electrolysis, heat or pressure, and it was a safe bet that even when the angles were steep and solid, heavy bone was encountered, the standard bullets on the shelf at that time would get the job done. Things rocked along well for decades, with great bullets available from a host of sources: Barnes X, Federal Trophy Bonded, Nosler Partition, Speer Grand Slam, Swift Scirocco, Winchester Super X, and Remington CoreLokt. Until a few years ago, the only thing we had to decide was which bullet shot the most accurately in our rifle. Performance-wise, they all got the job done, but then things changed again. Remington introduced the Ultra Mags, which featured as much magnum power as you can jam in a standard action, and the power bar was once again raised. Factory velocities for a 180-grain .30-caliber were now running at 3,200 fps. Many standard bullets couldn’t take the energy, including Remington’s own standby, the CoreLokt, so it was back to the drawing board. The CoreLokt Ultra was born, as was the Winchester XP3, Barnes Triple Shok, and the Super Premium bullet options. These are all extreme and highly technical examples of the bulletmaker’s art, incorporating all we now know about making bullets tough, reliable and accurate. They will perform under the most extreme ends of the velocity spectrum, and hold together under the harshest impact conditions. One example of just how far we’ve come is illustrated by what happened to me on an Australian buffalo hunt when an angry and particularly ornery bull popped up over a rise 30 yards from me at full steam ahead. A snap shot put it down, but that Winchester premium bullet actually had to go through 2 inches of sapling before it entered and penetrated deep into the buffalo’s vitals. That’s a truly amazing feat, and were it not for the toughness designed into that bullet, a wreck would have been the result. Do We Need Extreme Bullets? There’s the question. Does the average whitetail hunter need to spend the extra money for the high-tech upscale bullets? Is there a downside? In comparison to the bigger species like bear, elk, moose, even big mule deer, a whitetail has a pretty fragile frame. These premium bullets need a bit of resistance to open up, and 100- to 150-pound whitetail don’t offer a lot of “stop” for a bullet. My choice is to fall back to the second generation of proven bullets like the Winchester Power Point, Remington CoreLokt, Speer Grand Slam and others of their ilk for my whitetail hunting. They are far less expensive, very accurate and widely available. Most importantly, they have been proven effective for decades on whitetail, even when the bullet is placed a tad off the mark. For the bigger, meaner species, or for a long-awaited, high-dollar hunt where one shot at extreme angles might be all you get, there’s a lot of peace of mind to be had with a magazine full of the high-end bullets. But for the stand hunter, deliberate and unhurried, who doesn’t go for long-range shots, the standby bullets we’ve come to depend on are probably all he’ll ever need.